Two important dialogues offer crucial insights into mystical and aesthetic aspects of Platonic doctrine.Symposiumattempts to find the ultimate manifestation of the love that controls the world, leading to mystic union with eternal and supercosmic beauty.Phaedrusdiscusses the psychology of love, resulting in the concept of the familiar Platonic "forms" as objects of transcendental emotion. 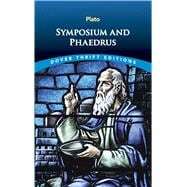 Plato ranks among the most familiar ancient philosophers, along with his teacher, Socrates, and his student, Aristotle. In addition to writing philosophical dialogues — used to teach logic, ethics, rhetoric, religion, and mathematics as well as philosophy — he founded Athens' Academy, the Western world's first institution of higher learning.